Denial. For Saints General Manager Mickey Loomis, it's the only word that can be used to describe the "nothing to worry about here" approach that he and the Saints organization appears to be taking; as the team prepares to open Training Camp --- which technically begins tomorrow morning when the team's rookies report for a week's worth of preparations, before the full roster reports next Wednesday (July 26th). So what is Loomis in denial about, exactly? More on that in a minute, but first: here's what the nationally-renowned medical research center Mayo Clinic says in its official clinical analysis for the human mind of people that are in a state of denial --- just like the Saints general manager apparently is. Being in a state of denial is refusing to acknowledge that something is wrong; and it is a way of coping with emotional conflict, stress, painful thoughts, threatening information and anxiety. You can be in denial about anything that makes you feel vulnerable or threatens your sense of control, such as an illness, addiction, eating disorder, personal violence, financial problems or relationship conflicts. You can be in denial about something happening to you or to someone else (or in this particular case: your football team). That clinical analysis by the medical / mental health professionals at the Mayo Clinic would aptly describe the Saints general manager's view of his football team, as it heads towards what many are calling a "make or break" or a "do or die" (or as it was referred to yesterday: a "crossroads season") in 2017. Specifically what I'm referencing is a radio interview yesterday in which Loomis appeared on the brand new sports talk radio show that debuted (every weekday Monday thru Friday from 10 A.M. Central to Noon) on New Orleans Fox Sports 1280 AM radio called "Dunc And Holder" --- and hosted by long-time and well-respected New Orleans Times-Picayune / NOLA.com writers / reporters/ columnists / analysts Larry Holder and Jeff Duncan. Loomis was the show's first ever guest, and addressed a variety of topics, including the medical condition of defensive tackle Nick Fairley and the status of the other pro sports franchise that Loomis oversees: the NBA basketball franchise New Orleans Pelicans. (To listen to the entire Mickey Loomis Interview, click the PLAY button on the Link right below and go to the 16:00 minute mark). Listen to "7/17/17 - Hour 1: Saints/Pelicans GM Mickey Loomis" on Spreaker. "Is this a bit of a "crossroads" season for the Saints going into 2017?" "Ummm.... I mean, I don't look at it like that....I think each one of those seasons (the last 3 straight seasons of 7-9 finishes), you look at it going into the season like 'Hey -- I think we can be good'. And so obviously, the results speak for themselves." "We're not happy with 7-9. I think when I look back at each of those seasons, I see opportunities where we could have done better -- and so, I kind of feel like that's where we're at this year. I'm excited about our roster. I'm excited about our team." "Obviously, we have a great leader at the position of quarterback; I don't look at it as a "crossroads season" for him, certainly (Loomis laughs). He's (Brees) proven time and time again that he's way beyond that." "So.....I look at it like we've got an opportunity and we've got a good team...We've got a great coaching staff, and we'll see how it falls." There's actually nothing wrong with Loomis' take on the team, given that they are very close to "turning the corner" and finally having a winning season, after 3 straight years of 7-9 finishes. Loomis seems to be in DENIAL of the simple fact that this actually is a "make or break", "do or die", or a "crossroads season" for this Saints team. Because there is NO WAY that the Saints can have FOUR LOSING SEASONS IN A ROW, without there being repercussions. There has to be an accountability for sub-par performance in New Orleans, just as there is in every one of the other 32 cities across the NFL. There are general managers and head coaches around the NFL who are being fired all of the time for a lot less than having 3 losing seasons in a row as the Saints have, and in some instances, have been fired even after they had winning seasons. Just yesterday in fact, Carolina Panthers GM Dave Gettleman was given his walking papers by team owner Jerry Richardson -- just a year and a half removed from a 15-1 season and an appearance in Super Bowl 50. So in that respect, Loomis is actually pretty damn lucky. Presumably, the only reason why Loomis and head coach Sean Payton are even still around right now is because of their close-knit and very friendly relationship with 90-year old team owner Tom Benson. I've always speculated that Benson has stuck with Loomis and Payton this long because of the fact that the Saints won the Super Bowl in 2009, and delivered the city of New Orleans its very first-ever professional sports World Championship. For Benson, a native of New Orleans that grew up in the city and the surrounding area like myself, winning Super Bowl XLIV was an unforgettably proud moment and a great achievement for his franchise --- the same franchise that he has owned for the past 32 years and has spent the better portion of the 2nd half of his life bringing it to respectability after many years of being the NFL's worst team. It's because of that why Loomis and Payton still have a job; when anyone else in the NFL with 3 straight losing seasons from 2014 thru 2016, would be feeling some serious "heat" right about now. That doesn't mean that The Old Man isn't paying attention. Case in point: let's take a quick trip back in time to the "Mike Ditka Era" (1997-99). In 1997, following the previous 1996 season that had seen former long-time coach Jim Mora quit (literally) in the middle of that season, Benson hired former Chicago Bears legend and Super Bowl winning head coach Mike Ditka to be both the team's head coach AND in essence, general manager. While GM Bill Kuharich was actually the team's general manager, Benson gave complete control of the football operations (a.k.a., "calling the shots") to Ditka. But unfortunately for Benson, it turned out to be the worst decision of his now 32-year tenure as Saints owner. In his dual role, Ditka tossed the Saints team right into the NFL’s ‘bottom barrel’; after trying (unsuccessfully) to recreate the magic that he had as a former Super Bowl winning head coach with the Chicago Bears in the mid 1980’s. Among some of the questionable moves Ditka made were a series of horrendous bad personnel decisions that also included the trading of the team’s entire collection of draft picks (all 7 rounds) to the Washington Redskins in order to move up in the 1999 NFL Draft to select University of Texas All-American RB Ricky Williams. 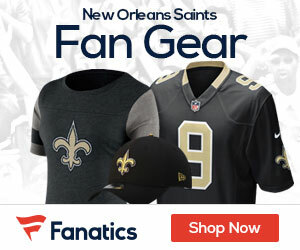 But Williams got hurt early in the season, and with a roster bereft of true talent the team was horrible; so bad in fact that they resembled some of the truly horrendous teams from the early 1970's --- the "dark age" of Saints football when they were THE WORST franchise in the entire NFL. Unfortunately for both Ditka and Saints fans, that “magic” that he once had with Chicago was long gone by the time he had gotten to New Orleans. The Saints limped home with a 3-13 finish to that 1999 season, which by the time it was finally and mercifully over, had even saw Ditka yelling at and verbally insulting reporters directly by the year's end. As you would expect, it was the team's fans --- the "Who Dat Nation" --- who had decided that they had seen enough. In early January of 2000 Benson was forced to listen to the outcry of demands of Saints fans who were openly and loudly calling for the proverbial head of Ditka on a silver platter — although he didn’t have much choice, or else there would have been a lynch mob that would have gone down to the team headquarters on Airline Drive armed with pitchforks, and physically removed Ditka in person themselves. Benson fired Ditka, general manager Bill Kuharich, and almost literally EVERYONE in the front office, in a complete and total "house cleaning". What the hell does that have to do with right now --- and what Mickey Loomis said on the radio yesterday? Tom Benson will ALWAYS LISTEN to the Saints fans. It's the reason why he even bought the team in the first place (when the team was in danger of being sold to out-of-state investors in 1985). And though Saints fans might not always agree with the moves that the Benson or his organization makes, they do have the POWER of influence over what happens with the direction of the team. If the Saints do not have a winning season and miss the Playoffs for a 4th straight season in 2017, then the "Who Dat Nation" should make their voices heard just as they did back in early 2000 --- and DEMAND that Benson make changes. And if that actually happens? Then Mickey Loomis could be in for the shock of his entire life.